Just curious your previous car aka sales, they offer you how much about paper? Same or higher then scrapyard? Same price as those in sungei kadut. But I don't need to drive all the way to sungei kadut and take taxi home. You can call the young chap and ask, very friendly guy. Workshop friends told me there are few co that does export to Malaysia, paying a few hundreds higher for the body but your car need to be those that can sell in Malaysia market. Safe or not I donno cos they don't pay cash. Looking for stockist for Honda in JB too. Is the price any better than sg? If you don't mind made in thailand or malaysia parts then stockist in JB will be cheaper, else, get them in SG and bring over for them to install. All motorists: Please signal your intentions early. Use your signal lights, its there for a reason. Must go to scrap dealer directly. Don't go thru workshop cos workshop will take a cut. 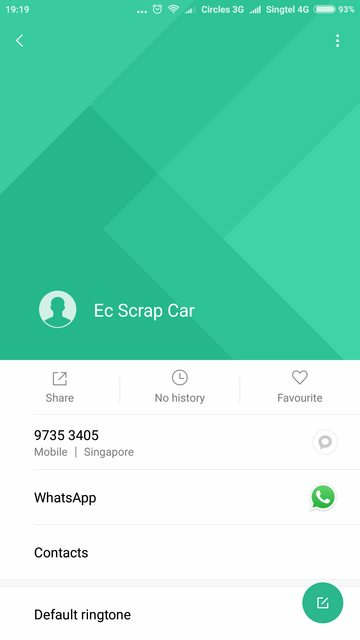 You can search for the list of appointed scrap dealer in onemotoring/LTA/sgcarmart and enquire price. From my knowledge after talking to a few scrapyard - in general SUV and MPV have the highest body price. Cos it's still in demand in 3rd world countries. Saloon and hatchback are the worst. Different conti got different value. Last edited by snipfer; 03-01-2018 at 11:31 PM..
As far as I understand the 5 appointed LTA scrapyards may seem to be offering the 'lowest body value' as everything can be done on the spot even on the last day too with the necessary stuffs needed (must be a working day) without much concern or worries. My friend just sent his car to an exporter agent directly, that seem to be offering the 'higher body value' if you car's make&model is in demand for it but you need to be doing the dealer's job by deregister yourself and later send the car disposal document yourself too. And some 'dealer' offer to take in(buying over) your car; depend on made&model again; who pay you upfront cash for paper+body as they may either export your car, swap your car parts for sales or even renew and sell for profit. So around a month before start calling around to ask for the best value of what is left in your car. If really no time, just sent to LTA scrapyards and get it done and over with with hassle which quite a handful of thread talked about it before. Do take note I have heard cases of scam although very rare - took your car, pay you a few hundred for the body, tell you LTA will send you a cheque for the rest. Then it didn't happen LOL. It's really deep sheet. So when I found EC scrap, I am so relieved cos FULL amount upfront in CASH. No need to wait for LTA. Heck care what happen to my car, cash in my pocket nothing can go wrong. Last edited by snipfer; 04-01-2018 at 09:44 AM.. Yes there are lot of scammers. The key point is not to sign any transfer form (M01) if the dealer is not buying over the car. Else owner can kiss good bye to their Parf le. Key point, dont sign blindly. Actually quite alot of dealer doing this based on my friend's experience then. He said lot can be found on Carousell, go ask for the best quota. Do take note of 1 of a dealer's trick. They may offer you $500 for your car but when they, they will said your condition is not up to their standard and start to neg downward. So good to ask if they want to view car first to play safe to be shortchange. My whole car already many stuffs from taobao, from customised leather carpet to full set of undercarriage struts. All sizes of bulbs...too many to post here. Aircon filter no need lah, let LCH make some money LOL. Taobao stuffs suitable for SG car? Yes almost everything. All my bulbs/lightings are from taobao. My spiral cell AGM car battery also from taobao. Unless your model is NOT sold in China which is very unlikely but still you get all kinds of accessories meant for cars in general. I even helped a fren to find a O2, lambda sensor for a Peugeot. LOL my fren not lying in hospital don't need oxygen tank. Of cos sensor lah.